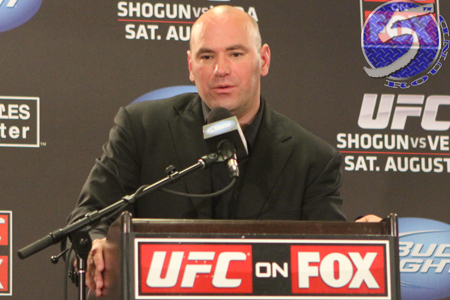 Following Saturday night’s “UFC on FOX: Shogun vs. Vera” extravaganza, UFC president Dana White (Pictured) hosted another one of his infamous media scrums. While White provides solid information at the post-fight press conferences regarding that specific event, everyone knows he offers up the goods on everything else MMA during his scrums. Rushed by a flock of reporters, White was bombarded with a barrage of questions. The Octagon’s head honcho touched on a variety of topics, including Junior dos Santos’ new-found disgust for that “punk” Alistair Overeem, Rory MacDonald’s eye gash, the fate of Rich Franklin and Cung Le and much more. We weren’t exactly front and center in the mob, but we were pretty darn close considering the amount of media present. UFC on FOX 4 took place inside Staples Center in Los Angeles on Saturday night.